Michel Chiha is born in Mekkine, Chouf, Lebanon The long awaited son after six daughters in succession. A further son and daughter would follow his arrival. 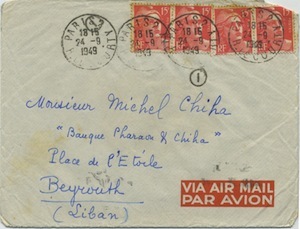 Michel Chiha takes refuge in Egypt to avoid Turkish repression (1914-1918). Takes refuge in Egypt to avoid Turkish repression. 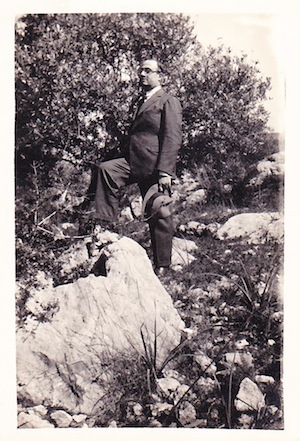 Like many of his compatriots, Michel Chiha had to leave Beirut during the 1914-1918 Great War and settle in Cairo where he studied Law and eventually obtained his law degree. 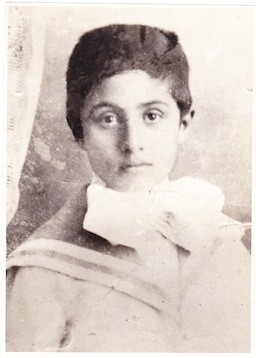 In a letter addressed to Hector Klat, one of the few letters found in the family archive in which he describes his life in exile, he gives details of visits to friends, of changing residences between Helouan, Cairo, and Alexandria and describes an enforced retreat to Ras-el-Bar. Most of his time was spent preparing for his law degree and editing the ‘Ébauches’. Although the account is fairly typical of the lifestyle of a young bachelor of the day it also highlights an early interest in art, music and literature. Michel Chiha takes up residence in Cairo. He took over the running of the Pharaon and Chiha Bank (Michel’s father Antoine passed away in 1903 having co-founded the Pharaon and Chiha Bank in 1876) at one of the most difficult times in his country’s history. A nation-wide famine had decimated a quarter of the population and one-fourth of the country’s homes were in ruins. For the next twenty three years it would continue to be celebrated on the 1st of September until 1943 when it was changed to November 22nd. Maxime Weygand, High Commissioner until 1925. 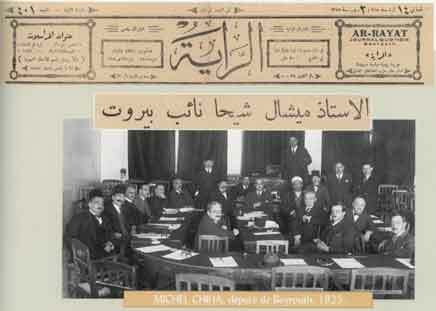 Michel Chiha joins Alexander Khoury’s newspaper ‘Le Reveil’, the only daily French-language newspaper to be printed in Beirut at the time. Marguerite Pharaon was the eldest daughter of Philippe Pharaon, Antoine Chiha’s partner in the bank. 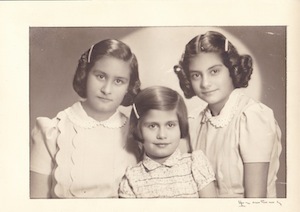 Together they had three girls: Micheline (d.1940), Madeleine and Marie-Claire (d.2013). High Commissioner Henry de Jouvenel announces the enactment of the Constitution as drafted by Michel Chiha: “This Constitution, for which, I believe, I have worked harder than anyone else”. Michel Chiha played a major role in the elaboration of the Lebanese Constitution. 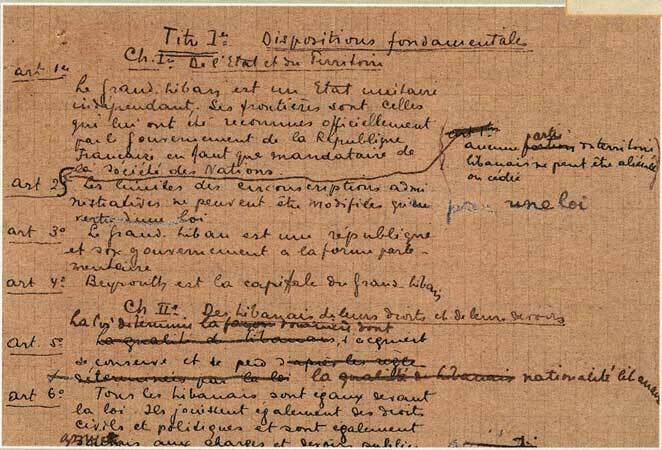 The extent of his involvement is reflected in the handwritten manuscript and the three separate typed versions which he annotated by hand. (1927-1929) Constitutional amendments under High Commissioner Henri Ponsot [1926-1933]. Michel Chiha is called upon to intercede with the Chamber of Deputies. In addition to his involvement with the proposed legislative amendments to the Constitution, as Head of the Parliamentary Finance Committee, Michel Chiha was also responsible for drawing up several fiscal and monetary policy recommendations aimed at establishing a coherent Government Budget. 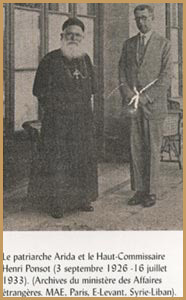 Michel Chiha helps establish the Beirut Stock Exchange. Michel Chiha founds the daily English newspaper ‘Eastern Times’. Declaration of Lebanese Independence on November 22nd. 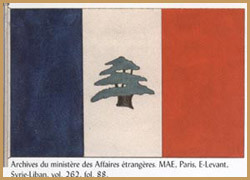 Chiha was a member of the committee appointed to choose a flag for the future Lebanese state. Michel Chiha was put in charge of incorporating its design with the symbolic and aesthetic aspects of the nation. There was disagreement over the exact shade of red being proposed for the vertical framing bands and the actual shape of the cedar tree and Michel Chiha was of the opinion that the shade of colour extracted from murex shells by the Phoenicians of ancient Tyre and which was used to colour the bright senatorial togas of ancient Rome ought to be used on the flag. 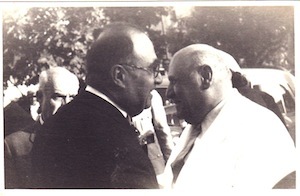 Béchara el Khoury, Michel Chiha’s brother in law, is elected President of the Republic. 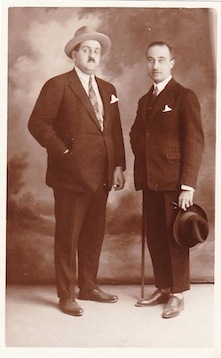 Michel Chiha was the Administration’s undisputed eminence grise, a role which he would support until the 27th May 1949 when Béchara el-Khoury decided to extend his presidential mandate for a further six years. 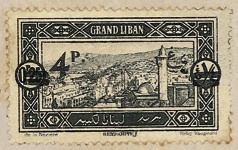 Evacuation of all foreign troops from Lebanon. Treaty signed on the 23rd March 1946. 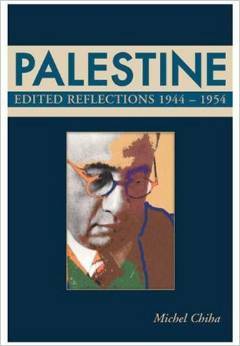 The Partition of Palestine – “One of the worst universal errors ever to be committed” M.C. 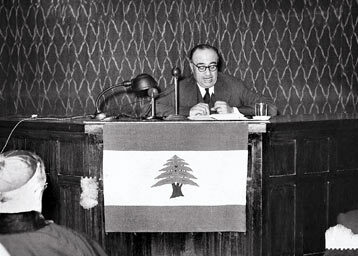 Béchara el Khoury is re-elected President in accordance with the amended law of the 22nd May 1948. These new stipulations allowed him to extend his presidential tenure for a further six-year term thus altering, albeit for the duration of a single mandate, Article 49 of the Constitution which decreed against re-eligibility. 6th February, Paris, Quay d’Orsay - Signing of the Monetary Agreement 1952 Béchara el Khoury resigns – Camille Chamoun is elected President. Camille Chamoun announces plans to revive the Economic Union between Syria and Lebanon - Michel Chiha publicly objects to it. 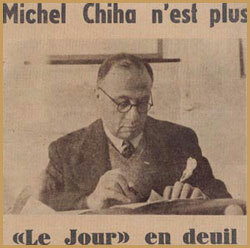 29th December - Michel Chiha passes away at the age of 63. He is buried in Fanar, Lebanon.